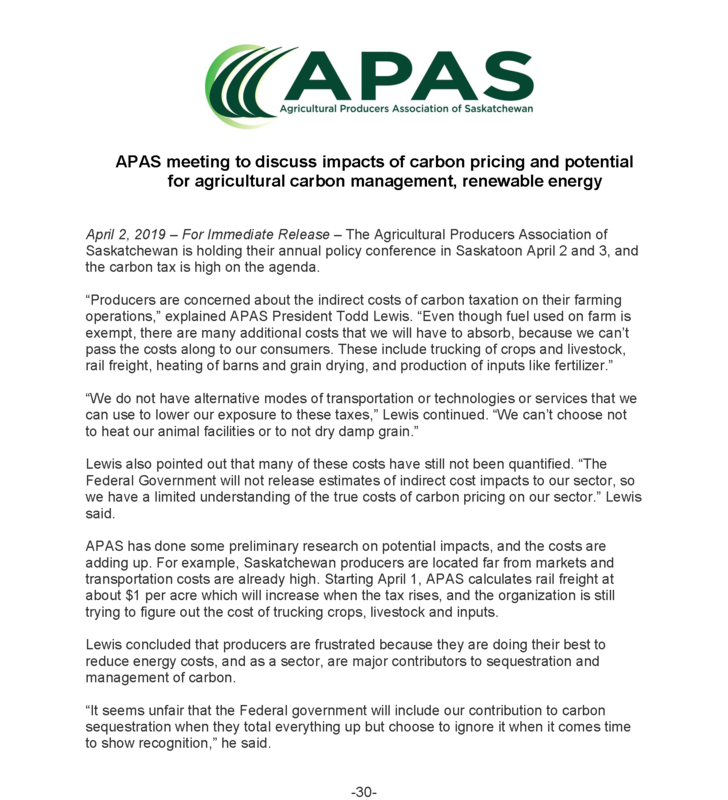 April 2, 2019 – For Immediate Release – The Agricultural Producers Association of Saskatchewan is holding their annual policy conference in Saskatoon April 2 and 3, and the carbon tax is high on the agenda. Lewis also pointed out that many of these costs have still not been quantified. “The Federal Government will not release estimates of indirect cost impacts to our sector, so we have a limited understanding of the true costs of carbon pricing on our sector.” Lewis said. APAS has done some preliminary research on potential impacts, and the costs are adding up. For example, Saskatchewan producers are located far from markets and transportation costs are already high. Starting April 1, APAS calculates rail freight at about $1 per acre which will increase when the tax rises, and the organization is still trying to figure out the cost of trucking crops, livestock and inputs. Lewis concluded that producers are frustrated because they are doing their best to reduce energy costs, and as a sector, are major contributors to sequestration and management of carbon. “It seems unfair that the Federal government will include our contribution to carbon sequestration when they total everything up but choose to ignore it when it comes time to show recognition,” he said.